All Rio rounds are proudly made and manufactured in the U.S. at their state-of-the-art production plant located in Marshall, Texas. The company’s success is founded on technology development and a thoroughly integrated production chain which manufactures all the main raw materials as well as all cartridge components, including cases, primers, powder, wads, and shot. 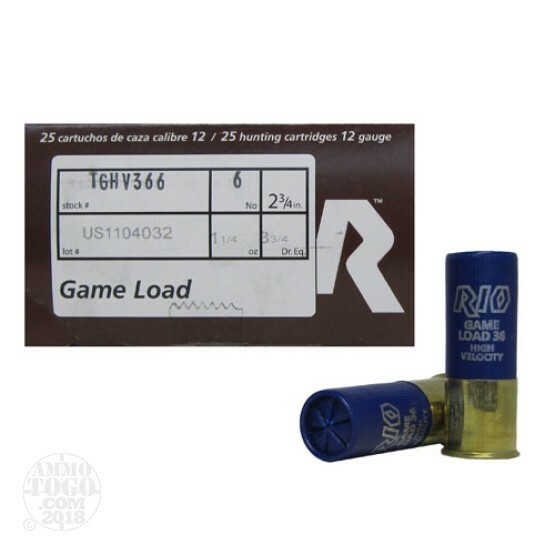 This package contains 25 rounds of Rio Top Game 12 gauge ammunition. Each 2 ¾ inch shotgun shell is loaded with 1 1/4 ounce of #6 lead shot. These rounds are manufactured with a highly balanced charge, which produces high velocities and moderate pressures for more efficient shot patterns. Each of these factory fresh loads produces an impressive muzzle velocity of 1330 feet per second. Use these high velocity game loads for hunting upland game birds, ducks, and small game like rabbits and squirrels.